When on the vCloud tab of the Self-service view, select the organization you need in the preview pane. Click the Remove button in the top left corner. When you remove an organization from the list of managed configurations, its configuration will be still effective for the old jobs. 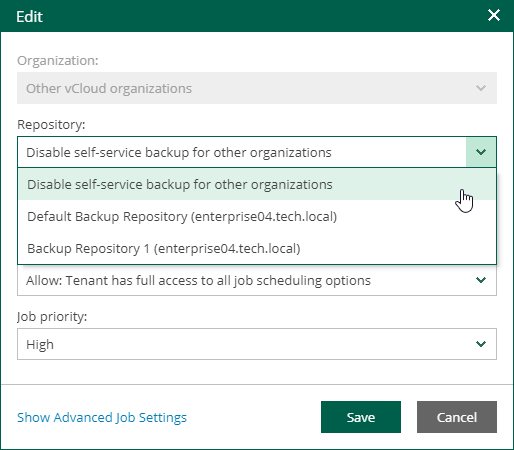 New vCloud Director backup jobs created after this removal will use default organization settings until you apply a new configuration to the corresponding organization. Select the default organization configuration in the preview pane. From the list of repositories, select Disable self-service backup for other organizations.